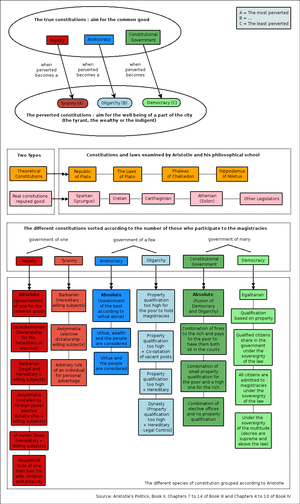 Aristotle discusses the parts of the household, which includes slaves, leading to a discussion of whether slavery can ever be just and better for the person enslaved or is always unjust and bad. He distinguishes between those who are slaves because the law says they are and those who are slaves by nature, saying the inquiry hinges on whether there are any such natural slaves. Only someone as different from other people as the body is from the soul or beasts are from human beings would be a slave by nature, Aristotle concludes, all others being slaves solely by law or convention. Some scholars have therefore concluded that the qualifications for natural slavery preclude the existence of such a being. 1 2 Ebenstein, Alan (2002). Introduction to Political Thinkers. Boston, MA: Wadsworth. 1 2 Lord, "Introduction," 27. ↑ Nichols, Mary (1992). Citizens and Statesmen. Maryland: Rowman and Little field Publishers, Inc.
↑ Lord, "Introduction," 19, 246n53. Kraut, ed., Richard; Skultety, Steven (2005). Aristotle’s Politics: Critical Essays. Lanham: Rowman & Littlefield. Nichols, Mary P. (1992). Citizens and Statesmen: A Study of Aristotle’s Politics. Lanham: Rowman & Littlefield. Nichols, Mary. Citizens and Statesmen. Mara, Gerald. "Political Theory 23 (1995): 280-303". The Near Made Far Away. Jowett, Benjamin (1984). Jonathan Barnes, ed. Politics. The Complete Works of Aristotle. 2. Princeton: Princeton University Press. ISBN 978-0-691-01651-1. Miller, Fred. 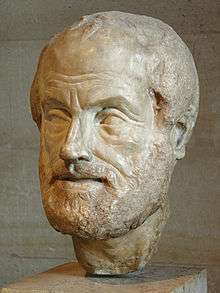 "Aristotle's Political Theory". Stanford Encyclopedia of Philosophy.